Despite the lengthy process of follow-up and preparations, dozens of Islamic State (IS)-era mass graves found in Ninawa’s Ezidi district of Shingal (Sinjar) have not been unearthed yet. The delay of the exhumation process is at a time relatives of Ezidi victims are losing patience, demanding the speeding up of the procedures to determine the fate of their loved ones. Shingal, 120 km west of Mosul was the scene of numerous atrocities committed by ISIS militants after they took control of the town on August 3, 2014. In November 2018, an Iraqi government team arrived in the area to embark on the unearthing process; however the work of the team did not start and no timeframe for the mission has been set. Earlier in September of the same year a forensic team assigned by the Iraqi government began collecting data and blood samples from relatives of missing Ezidis to help identify the remains of thousands of the victims. “Only remains is the timeframe for the exhumation to start, and that is bound to the security situation and awaits a joint decision by the federal government and the Kurdistan Regional government (KRG)”, he added. According to recent statistics of the KRG’s general directorate for Ezidi affairs at the ministry of Awqaf and religious affairs, 69 mass graves have been found in and around Shingal, believed to be containing the remains of hundreds of Ezidis slaughtered by IS militants after they overran the town in August 2014. 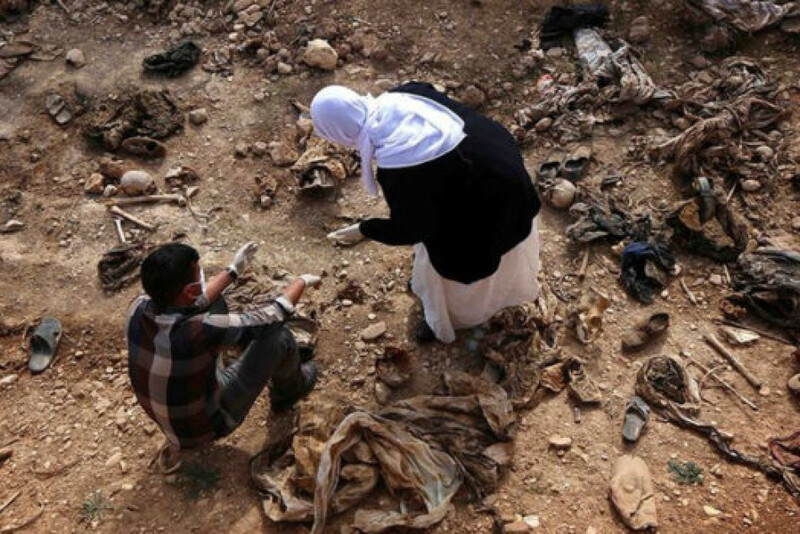 In mid-October 2018, a mass grave containing the remains of 17 people who were slaughtered by ISIS militants during their control over Ninewa province in 2014 was uncovered by relatives of the victims in the town of Tala’far. The mass grave was unearthed without the permission of the special committee assigned to carry out the process. Meanwhile, flash floods triggered by a recent wave of heavy rainfall have swept away the remains of Ezidi victims buried in Shingal mass graves. The town of Shingal predominantly-populated by Ezidis was overrun by IS on August 3, 2014, and was recaptured on November 13, 2015.